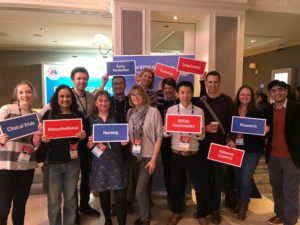 Four first time attendees at BTOG 2019 kindly took the time to write a blog about their experience and thoughts on the conference. 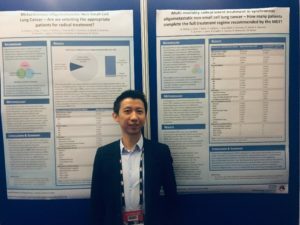 This was my first time attending the British Thoracic Oncology Group Annual Conference in Dublin. I was very grateful to be given the opportunity to speak at the conference, especially as this was my first time speaking for twenty minutes at a scientific meeting. When I arrived at the Clayton Hotel, I was very impressed by the organisation and layout of the conference hall. The communication from the organisers has always been excellent. The hotel staff were also very accommodating. At my spoken session, I was able to present my research findings (the prevalence and significance of sarcopenia–loss of skeletal muscle mass–in a malignant pleural mesothelioma population) to an expert audience of respiratory physicians, thoracic oncologists, specialist nurses and scientists, among others. I was also able to summarise key definitions and current treatment strategies in the cancer cachexia field. The chairs of my session and audience members asked me a variety of important questions relating to cancer cachexia. I was especially humbled by the number of people who introduced themselves to me at the end of the session. Throughout my time at the conference I was given plenty of opportunity to meet and network with leading academics in the field of thoracic oncology. The spoken sessions covered a variety of conditions, including non-small cell lung cancer, small cell lung cancer, malignant pleural mesothelioma and thymoma. They were relevant and informative. The scientific posters displayed in the conference hall were equally engaging. In summary, I felt very supported by members of the thoracic oncology community attending this conference. I would highly recommend the conference to any members of the thoracic oncology multidisciplinary team and budding clinical researchers. I would like to extend my sincere gratitude to the British Thoracic Oncology Group for giving me the opportunity to attend this meeting. I very much look forward to my next BTOG conference. The 2019 annual meeting at the Clayton Hotel in Dublin was my first experience of a BTOG conference. Along with many other delegates, I was fortunate to get a generous scholarship from BTOG to attend this years event; I considered myself equally fortunate to have negotiated time away from my A&E rota to attend. As a junior doctor keen on an academic Oncology career this was a great opportunity to gain insight into the latest developments in a variety of aspects of thoracic oncology. In addition, it is a matter of months until I start a translational lung cancer PhD, and I was particularly looking forward to hearing about the advancements and challenges in our understanding of the biology of this disease. As such, the first session of the congress was particularly interesting. I chose to attend the Translational Oncology Symposia which featured a variety of interesting talks. Prof O’Byrne overviewed the role of SSB1 and other associated proteins involved in a critical DNA repair pathway. His data suggested that one such protein, CDCA3, may represent an exciting actionable therapeutic target in the near future. In addition, we heard from Nirupa Murugaesu about the work of the Genomic Tumour Advisory Boards and the real-world impacts of the 100,000 Genomes Project, including trials stratified by genomic patient data, that we can look forward to in coming years. There were also insights into future anti-cancer strategies with engaging talks from Sophie Papa about Adoptive Cell Transfer therapies and novel approaches to target KRAS-mutated lung cancer from Udai Banerji. The plenary session on Thursday morning featured Harry De Koning overviewing the challenges of delivering effective lung cancer screening using low-dose CT in the NELSON trial, and Keith Kerr delivering a pathologist’s take on the difficulties of performing next-generation sequencing on samples when obtaining sufficient tissue for IHC is already a challenge, as well as several excellent oral presentations. Afterwards, poster presentations were showcased. There were a great number of fantastic posters on display. My former Registrars, Joanne Evans and Ailsa Sita-Lumsden, and myself presented our poster highlighting some of the barriers to EGFR+ NSCLC patients in North-West London accessing second-line Osimertinib therapy. What made BTOG particularly enjoyable was the opportunity to meet and engage with practising oncologists from other parts of the UK, including at the Annual Conference Dinner. This featured an inspiring speech from Chris Draft, whose wife sadly died of lung cancer in 2011. All in all, the 2019 event was a brilliant first taste of a BTOG congress, and I will most definitely be back in 2020. As a specialist respiratory trainee with an interest in thoracic malignancies, my motivation to attend my first ever BTOG conference comes from an inner desire to push the boundaries of evidence-based practice. Having attended general respiratory conferences in my junior years, this would be my first attendance at a sub-specialist meeting. My expectations prior to attending were mixed. Would I be cast aside as an outsider from well-established academic circles? Would I come back to Manchester more confused than when I left? What would I write in the BTOG2019 blog? Thankfully, all my woes would be proven unfounded. My journey to BTOG starts at home in Manchester. First issue? Crossing the Irish Sea with a 1m long plastic tube containing our team’s 4 posters. Simple in concept, tricky in practice, compounded by the regimented policies of economy short haul flying. My solution was to check-in the largest suitcase I could find. The better solution would have been to take up BTOG’s alliance with a fabric poster printing company, delivered straight to the venue. Lesson learnt. Wednesday 5AM alarm, fast forward a few hours and we arrive in Dublin. My first impression was that the hotel staff and BTOG faculty were fantastic. Highly organised, approachable and friendly, with smiles throughout. I picked up my scholarship badge out of a record 920 attendees. Unfortunately, the Clayton Hotel was booked up early and so a journey to our rented apartment needed to be slotted in. Certainly, for the convenience of a 2-minute journey from room to symposia, I will book early onsite in future! The programme itself over 3 days was varied and jam packed. Whether you’re a radiologist, oncologist, specialist nurse or general respiratory physician, there is something for everyone. The mixture between self-selected focussed plenaries and structured symposia was perfect for me. I was pleased to match faces to infamous names, and encouraged to see speakers from my region driving innovation. The standard of the posters was not only exceptionally high, but the content was impressively varied. I was forewarned not to miss out of the BTOG formal dinner, and thank goodness I listened. There are too many memorable points (and occasional not so memorable points) to mention, but the highlight was Chris Draft’s powerful motivational speech. The large hall was silent for the NFL Ambassador’s story of his wife Keasha, who battled with lung cancer. I was left with an inspired yet sombre feeling which reminded me of how much progress we have made but also how much work there is left to do. The evening also presented a fantastic opportunity to meet and socialise with the wider BTOG network. A combination of peer pressure encouragement and Irish courage inspired me to speak to anyone who would be happy to shake my hand. Encouragingly, no one said no, and most obliged with the millennial tradition of a ‘selfie’ too. Would I come again? Without a shadow of a doubt. Anyone who is involved in caring for patients with lung cancer and mesothelioma will gain something. For me, my BTOG journey was about consolidating the evidence to prepare me in delivering the excellence of care that patients deserve. Gaining insights into future research and meeting approachable like-minded individuals were additional bonuses. In summary; terrific conference, motivated community, highly educational. My study leave form for BTOG 2020 is already filled and ready to send! I entered the Clayton hotel on my first ever day of BTOG to find that a helpful Irishman from the company I’d ordered my poster from had already put mine up for me so that I could “enjoy a cuppa before it all starts.” I’m happy to report that this friendly welcome continued into the day with the first talk - an introduction to the day from the BTOG chair. It was set out that the aim of BTOG was to ensure equitable and optimal care for all patients with thoracic malignancies through education and research. Throughout the day I was struck by just how much research is going on in thoracic oncology at this time. This was evident in talks from our European colleagues at ETOP and EORTC as well as updates from immunotherapy trials, where there are more than 5 current RCTs at this moment. This shows how dynamic and exciting thoracic oncology currently is and from talking to colleagues in the breaks it is clear this feeling is shared amongst doctors, nurses and the pharmaceutical companies alike. It was also made clear from a speaker from my own trust (Prof Hatton, chair of the NCRI) that this research and innovation is needed as thoracic malignancies are common, preventable and unfortunately carry a poor prognosis at present. The prognosis for these diseases is obviously poorer the later and more advanced it is when picked up. A focus of the day seemed to be on screening and the evidence presented would suggest this was with good reason. We were walked through the NELSON trial, the results from which are showing a 25% reduction in 10year mortality with low dose CT screening. Screening was a theme that was touched on throughout the day by presenters from the ACE programme and several of the oral poster presentations. I was especially intrigued by a presentation from a radiographer who demonstrated that immediate reporting of CXRs by radiographer led to earlier detection of malignancies. In an environment where earlier detection can lead to catching a disease at an earlier stage and thus better prognosis it will be interesting to see if other hospitals will attempt to utilise this workforce in a similar fashion. Whilst the day invited discussion and thinking about complex topics such as screening it was also educational. I’d never thought I would want to see questions on thymic malignancies or mesothelioma in my upcoming medical exams but after this conference I am. The talks on these topics were not only comprehensive but were also given by leading experts who were able to make sense of these complicated diseases to an audience that was diverse in their prior understanding of them. I have taken so much from my experience at BTOG and I am most grateful to the group for their scholarship that allowed me to attend as I know so many others are. My only regret is that I could only attend for one day - something I hope to rectify in the very near future.